Vale la Pena evolved out of the discovery of a remarkable vineyard. As you travel south from the city of Mendoza, the elevation rises to over 1100 meters, the ground becomes littered with rocks, and vineyards give way to a desert that stretches to Patagonia. Here is where Vale La Pena is sourced, from a single vineyard in San Carlos called Iris. The vines grow in gravelly sand/loam over alluvial boulders. The average vine age is about 80 years and produces less than 1.5 tons per acre. The fruit is allowed to macerate for two to four days until natural fermentation begins (no yeast or SO2 ever added) in small, traditional epoxy-lined concrete fermenters. It is then pumped over through an oxidating screen. The fermented juice is then shipped in food grade containers up the cool Pacific, stored below the waterline to keep it cool and minimize rocking, to his winery in Graton, California for barrel aging. This reduces the carbon footprint, by not shipping the weight and bulk of cases and bottles, in addition to giving Patrick the ability to keep a closer eye on the aging process. 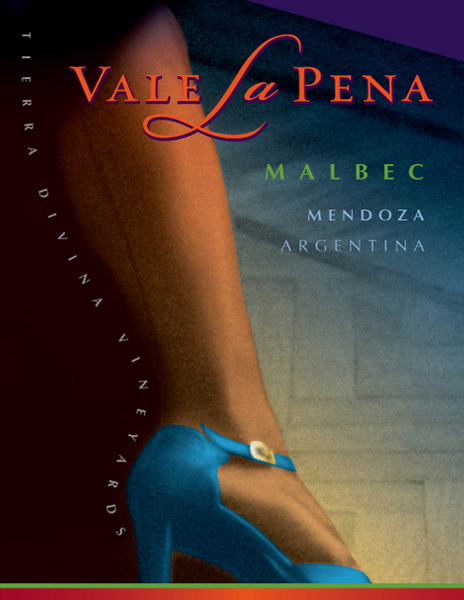 Vale La Pena is aged for over 12 months in French oak barrels (about 70% new). Minimal fining with egg whites if necessary and then polish filtered.